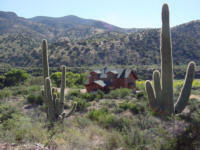 The property is near Giselia, Arizona, between Phoenix and Payson and is roughly 1 1/2 hours from Phoenix. 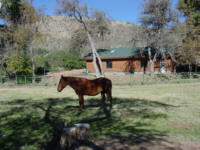 From Rye, the property is approximately 5 miles off the Beeline Highway (US 87). 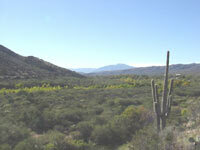 Surrounded on three sides by the Tonto National Forest. The property is on the western boundary of the Hellsgate Wilderness. 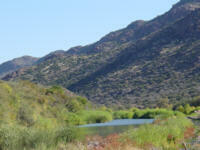 Tonto Creek runs along the south side of the ranch. The property is at 2,945 feet. Power, phone, wells, septic, satellite. 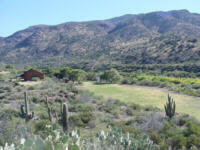 The 4W Ranch is an outstanding property with classic Arizona riparian features and irrigated pasture. It is an island surrounded on three sides by National Forest which provides unlimited opportunities for horseback riding and hiking. The Hellsgate Wilderness is a stones throw away. 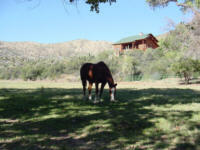 It is easily accessible from Phoenix and Payson but is at the end of the road with a locked gate. 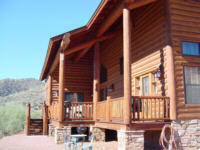 The exceptional custom home was featured in "Country's Best Log Homes" magazine.